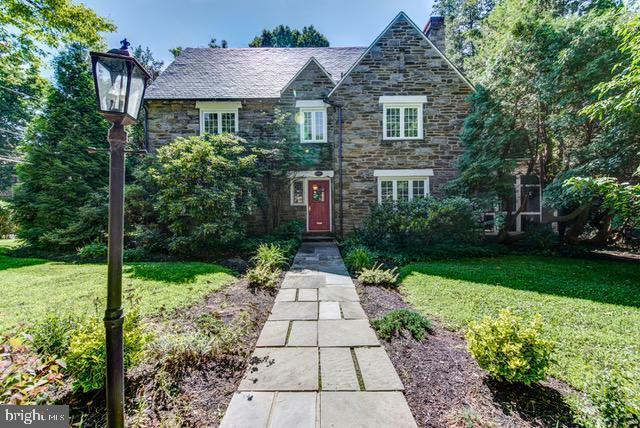 Truly remarkable Classic Stone Center Hall Colonial! The gorgeous State of the Art Kitchen would WOW even a Top Chef...Thermador ovens and microwave, 6 burner gas cooking, double faucet with pot filler, Liebherr refrigerator w double freezer, Bosch dishwasher, industrial strength exhaust, and spacious Island housing the wine refrigerator. Custom self-closing cabinetry as well as custom pantry. Recessed lighting enhances the dramatic design and craftsmanship of this cutting edge Kitchen. Beautiful natural quartzite counters, marble backsplash and porcelain tile flooring add incredible flair. Adjacent Breakfast Room w palladium window and exit to fenced rear yard. Traditional Center Hall foyer with beautiful leaded glass accents. Generously sized floor plan with excellent flow. 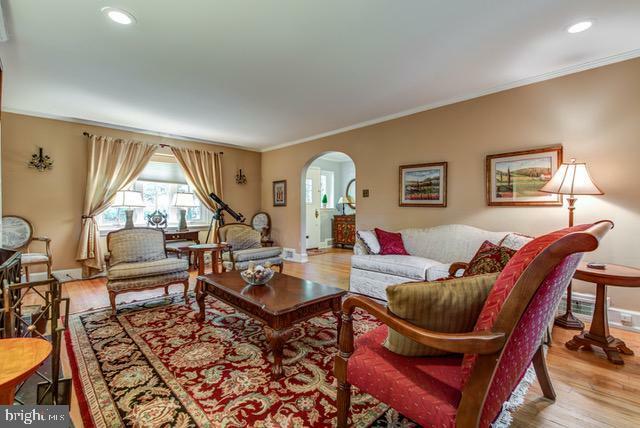 Formal Dining Room with crown moldings, bench seat and French doors leading to Kitchen. 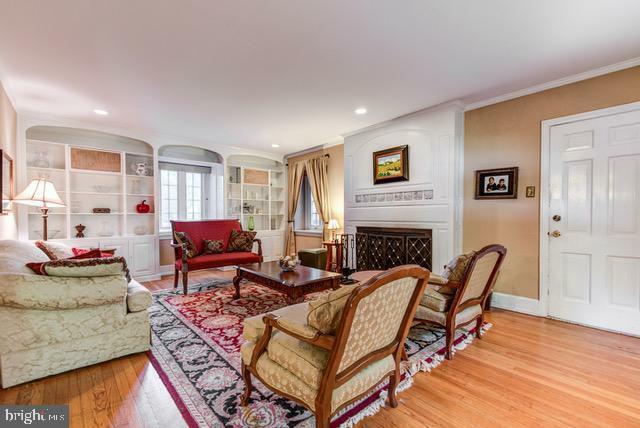 Pretty Formal Living Room with wood burning fireplace, leads to a private screened in porch w flagstone floor. The second level has a Master Bedroom w/Master Bath and 2 closets. The 2nd Bedroom with door to huge balcony. Two additional Bedrooms plus a gorgeous custom Bathroom with Jacuzzi style tub and shower enclosure, and double sinks. On the third level is the 5th Bedroom and a very large Bathroom with newer fixtures and vanity. 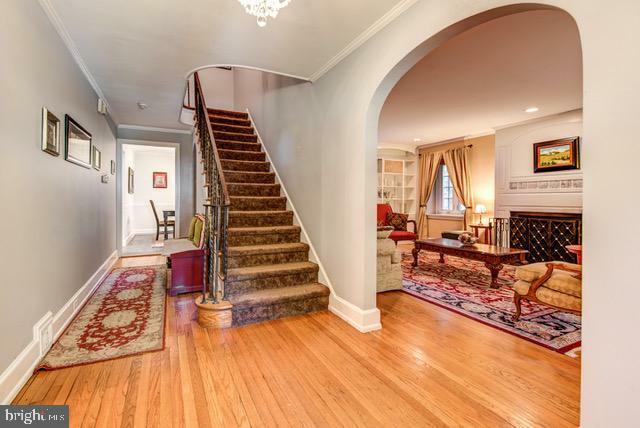 Huge floored walk-in Attic with exposed stone wall offers tremendous possibilities. And now for the BIG SURPRISE!! COMPLETELY REDONE custom BASEMENT w porcelain tile floor, and another gorgeous custom Full Bathroom w subway tile. Waterproofed. High hats, Walk Out Basement. ALL NEWER (30) WINDOWS!! Exposed hardwood floors. 2 Car Garage w Direct Entry. When you talk about location, you can't do better than this. Walk to train, playgrounds & parks, the new Sparrow + Hawk Apothecary and all of the shops and restaurants in our downtown Elkins Park community.